138th day of the year. There are then 227 days left in 2019.
on the 20th week of 2019 (using US standard week number calculation). 60th day of Spring. There are 35 days left till Summer. 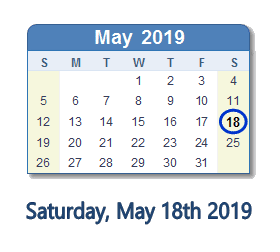 May 18, 2019 is the 13th day of Ramadan (Muslim Obsrvance). What happened on May 18th 2019?